Let me begin by wishing my US readers a Happy Independence Day! ...That said, it's the 4th of July, it's really hot out, and to be honest, I'm feeling just a wee bit lazy today. Of course, I didn't want to completely forsake my challenge today, so forgive me, but I'm going with a slightly "easy" (aka less research and effort required) topic today. 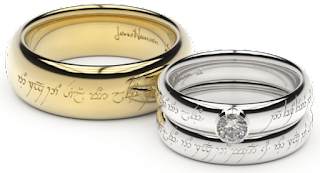 From the Old English warg come J.R.R. Tolkien's wargs, an intelligent breed of wild (and evil) wolves which roamed Rhovanion (Wilderland). They may have been bred by Morgoth in Angband, the result of combining two creatures; it is possible that they were descendants of Draugluin's werewolves, or of the wolf-hounds of the line of Carcharoth. Because of their intelligence (through which they have acquired their own language, as well as the ability to understand some of the Black Speech), they are typically in league with the Orcs, as opposed to a number of other wild creatures the Orcs have tamed. 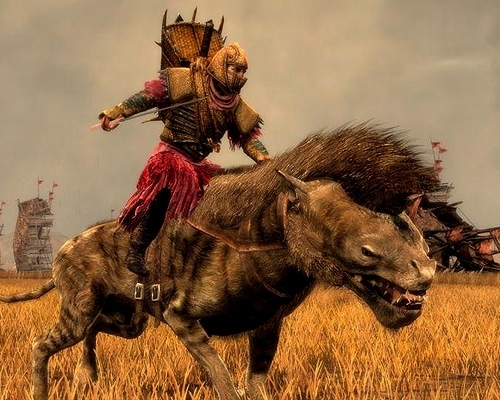 Physically, wargs stand about five feet at the shoulder, and could measure up to ten feet in length from snout to tail. 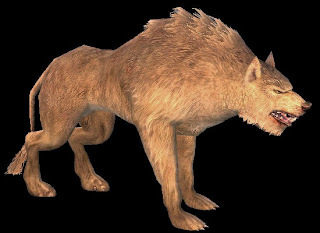 Their fur was dense and rough, protecting it from damage by foes and even other members of their pack (wargs were known to turn on one another, as well as on their handlers). Yeah, I need to get me one of these! And happy 4th! I assume you live in the US, but you know what they say about assuming, so happy 4th anyway! Happy 4th(now 5th) to you as well! Hope yours was grand!